Coral Gables, Fl. – Don Slesnick, former Mayor of the City of Coral Gables, received the distinguished honor this past week of being given the Outstanding Civilian Service Medal. This award was established by the United States Army to recognize private citizens that have demonstrated exceptional public service on behalf of the nation’s military. General Douglas Fraser, Commander of the United States Southern Command, presented the award at a ceremony in Mr. Slesnick’s honor at the Conference Center of the Americas. 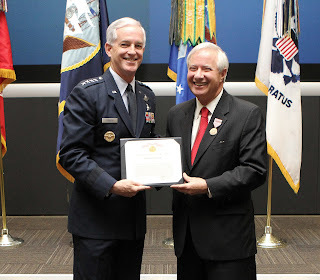 General Fraser said, “[Mr. Slesnick’s] consistent superior leadership within the community of South Florida has been exceptional and reflects his unwavering support of United States Southern Command and all military service members.” The medal honors Mr. Slesnick for his tireless contributions to the Team Miami project which worked to save Homestead Air Reserve Base after its destruction by Hurricane Andrew, direct involvement in the Southern Command’s relocation from Panama to South Florida, and superior leadership in the community as a public servant active in numerous civic and business organizations. Mr. Slesnick served 10 years as Mayor of the “City Beautiful” Coral Gables from 2001-2011 and served as President of the Florida League of Mayors from 2009-2010. He is a Vietnam veteran, retired Army Lieutenant Colonel and former U.S. Army advisor to NATO forces in Germany, and is currently an Army Reserve Ambassador for Florida. He is the managing partner for the law offices of Slesnick & Casey, LLP and has practiced since 1972, representing public sector employee organizations. Don Slesnick recently completed a decade as Mayor of the City of Coral Gables, Florida (served from 2001-2011) and served as President of the Florida League of Mayors (2009-2010). Mr. Slesnick is the managing partner for the law firm of Slesnick & Casey, and is on the Board of Directors of Great Florida Bank. His offices are located at 2701 Ponce de Leon Boulevard Suite 200, Coral Gables, FL 33134-6041, and he can be reached at 305.448.5672 or donslesnick@scllp.com. He has been in private practice as a lawyer since 1976, representing public sector employee organizations. Prior to this, he held management positions with the Dade County Public Schools and the Dade County Police Department. Mr. Slesnick has served as Chairman, Miami-Dade County Cultural Affairs Council; Chairman, Dade Cultural Alliance; President, Dade Heritage Trust; President, Jr. Orange Bowl Committee; President, Rotary Club of Coral Gables; President of the Two Hundred Club of Greater Miami and President of the Florida Trust for Historic Preservation. A 58-year resident of Miami-Dade County, he graduated with Honors from Miami Senior High School, received his B.A. from the University of Virginia, a J.D. from the University of Florida and a M.P.A. from Florida International University. He was admitted to the Florida Bar in 1972 and the U.S. Supreme Court in 1985.